Turkish Treasury and Finance Minister Berat Albayrak on Friday unveiled a new economic model for the short and long term. He stated that the new economic model will be decisive and target change in addition to the new approach being sustainable. Stating that Turkey would prioritize structural reforms, “The first step of the new approach is economic balancing,” he said and emphasized stronger budget discipline. The next steps will be lowering Turkey’s current account deficit and improving trust, Albayrak added. "Turkey will establish a new finiancial regulation authority." 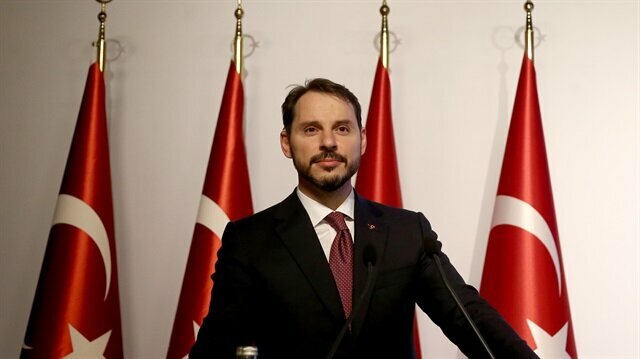 Turkish Treasury and Finance Minister Berat Albayrak is set to announce on Friday a "framework for a new economic model", the ministry announced on Thursday. The new set of economic steps are aimed at securing an economic growth of 3-4 percent in 2019 and decreasing the inflation rate to single-digits, the ministry said in a press release. "It is expected that current account deficit would be balanced around 4 percent," the ministry said.The ministry added that it will continue to take steps to cut the budget deficit to around 1.5 percent of the country's GDP. "The Treasury's debt rollover ratio to be reduced below 100 pct," the ministry said.The statement also mentioned the ministry targeted a non-interest surplus of 5 billion Turkish liras ($927.3 billion) by end of 2018 through savings and income-generating measures.The Turkish banking system is capable of managing financial fluctuations effectively thanks to its strong capital structure and balance sheet, according to the ministry statement. Contrary to speculations, Turkish banks and companies face no problems in terms of currency and liquidity, it said.It added: "Until the end of the year, our main goal will be to meet these targets by taking action with regard to fiscal policies." "Turkey will emerge stronger from this period," concluded Berat Albayrak. As Albayrak was giving his speech, U.S. President Donald Trump announced on Twitter that he had doubled steel and aluminum tariffs on Turkish imports. "I have just authorized a doubling of Tariffs on Steel and Aluminum with respect to Turkey as their currency, the Turkish Lira, slides rapidly downward against our very strong Dollar! Aluminum will now be 20% and Steel 50%. Our relations with Turkey are not good at this time!" he wrote.